A Bonnie and Clyde tale predating Gun Crazy (1950) by eleven years. Persons in Hiding is the first of four movies adapted from J. Edgar Hoover’s book of the same name. Electrifying debut by Patricia Morison with J. Carrol Naish strong opposite her. Paramount’s 1934 version of The Witching Hour is light on stars and, despite the title, isn’t even a horror movie. An early Henry Hathaway film based on the 1907 hit play by Augustus Thomas and featuring strong performances from John Halliday and Sir Guy Standing. It’s all covered here. A look at William Frawley in the years before he achieved his greatest fame as Fred Mertz on I Love Lucy. 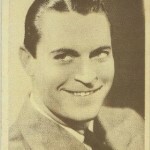 Special attention is paid to his baseball movies and his early days on the vaudeville circuit and Broadway. The article is illustrated with seven promotional photos from the 1939 film St. Louis Blues.